Shri Ram; the Marayada Purshottum is widely respected and worshipped in India. A lot of mantras and prayers are dedicated to him. The mantra given below is one such powerful mantra which is used to relieve chest pain. The chest pain can be due to a variety of reasons ranging from medical ones to physiological ones like fear. These are most simple home remedies for loss of appetite and taste. You can safely try these home remedies if you are suffering for any of these ailments. Mix the juice of Lime and Ginger in equal quantities and then add a pinch of Rock Salt to the mixture. About 2 teaspoons of this mixture should be taken 3 to for times daily. The appetite is restored back to normal in about 5 to 6 days. These are some most simple home remedies for Dry Cough and Tonsillitis. The person suffering from dry cough is at his wits end on how to stop the continuous involuntary coughing.You can try this simple home remedy which will make you feel better. These are most simple home remedies for Obesity and Flatulence. Revelation 19 describes what is said to be the Battle of Armageddon. In fact this is the Battle of the 10th and final Avatar of Vishnu Kalki Avatar, who manifests in the closing stages of the Kali Yuga. Revelation 19 is Bible Prophecy on the Battle of Kalki Avatar. This prophecy has been linked to what is called “the second coming of Christ”. However the prophecies never name Christ; but the description of Kalki Avatar is most accurate. This prophecy describes the magnificent white horse; the mount of Kalki Avatar and his shinning Supernatural Sword. This is the most effective and powerful Shiva mantra to seek the divine protection of Shiva. This mantra is said to fulfill your innermost wishes, give protection against evil energies and avert the dangers coming you way. The worship of Guru Dattatreya is of paramount importance in the Navnath Sampradaya, as well as for anyone aspiring to be a Siddh Purush [spiritually evolve person]. Guru Dattatreya as explained in my earlier posts is the Supreme Being – the sum total of Brahma, Vishnu and Mahesh. Hence he is worshipped as the ultimate Guru; the Guru of the Gurus. As I have said before and the true Bhakts of Ganesha must known by now that their beloved God Ganesha has solutions for everything. This one here is a very simple yet powerful Ganesh Mantra to fulfill wishes. This Ganesh mantra to fulfill wishes has to be recited 540 times in the early hours of the morning, before sunrise. The dedicated disciples of Ganesha need not despair, if some of their work has been unnecessarily blocked; due to no conceivable reason. Ganesha has solutions for all problems. The Ganesh Bhakts are one of a kind; they mostly go about life in a straight forward and honest manner. This is so because the worship of Ganesha is Satvik [pure] in nature. This is another of the futuristic Quatrains of Nostradamus which I am inclined to believe refers to the much awaited World War 3. The great stench is the description of chemical or biological weapons, which are going to be used freely in the course of World War 3. The fire seen in the sky is one such missile carrying a chemical of biological warhead. This one here is another of the unique Indian Mantras for specific purposes. This is another mantra for having a child. This mantra is given here for those childless couples desirous of having a child. This mantra is dedicated to Balkrishna; the child form of Shri.Krishna.The Mantra should be recited in front an image of Balkrishna, preferably by both the husband and wife 108 times daily. The past one year has seen an influx of Vashikaran cheats, criminals, fraudsters, scamsters sites. These cheats who have opened sites under a variety of impressive sounding tittles are seen advertising not only from their sites but also all over the web; especially free classified sites. This is a continuous bombardment of spam advertising. Depression is a common symptom in most of those who are striving for a higher state of existence. In the spiritual sense, those who try to reach a higher state of existence, feel depressed when success doesn’t come their way quickly. Depression is caused due to a sudden shortage of Prana or the Life Energy in specific parts of the body. In this state one starts feeling lethargic and finds himself lacking in will power and drive. This is a very unique and most powerful mantra for luck. Very often it is noticed that one puts in a lot of work, but in return gets very little output. All this is just a question of luck and opportunities coming your way. This rare and powerful mantra from the ancient Indian scriptures is said to ensure one becomes lucky and opportunities come ones way. Such lucky opportunities ensure success in job, business and trade. The mantra is also said to bring lucky opportunities come your way if you are trying to go overseas for job or business. This is a very simple, yet most powerful Ganesh mantra to progress in your job. 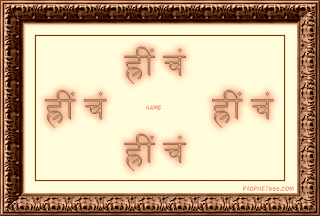 This mantra like all Ganesh mantras and prayers is a Sattvik [pure] mantra. Hence there are no other requirements other than good intentions and sincerity. This is a most powerful and beautiful Shiva mantra to attain mental peace. In today’s fast paced life with its nuclear families; most people lack that vital ingredient for happiness; mental peace. This mantra is one which the most reliable of the Indian scriptures say vibrates to the unique frequencies of peace. This Shiva mantra is recommended to be recited 108 times everyday; this ensures peace, bliss and success in life. The most number of requests which I get is by women who have some misunderstanding or the other with their husbands and are unhappy. These women say that their lives have become miserable because their husbands do not Love them. I had stopped writing about Attraction and Vashikaran mantras because these mantras were being misused by unscrupulous elements; this was brought to my notice by a lot of the readers of this site. This is a very powerful Ganesh Uchatan mantra or the Ganesh mantra to stop an enemy from troubling you. This mantra like all Ganesh mantras is Satvik [pure].Hence the practitioner need not worry about any malefic effects coming his way. The cycle of generation and regeneration is an unchangeable fact of existence. This is a continuous process which is always happening all over the universe; our world is no exception to this basic law of nature. The destruction of might empires is a tiny occurrence compared to the destruction of galaxies and solar systems which is always happening at some place in time.The world has witnessed a large number of such seemingly unshakable empires and dynasties bite the dust. There are countless devotees of the mother goddess not only in India; but all over the world. The mother goddess is worshiped in numerous manifestations or forms; this entirely depends on the devotee’s personality; how he visualizes her as. Due to a variety of illnesses and diseases one feels and experiences unbearable pain and does not know what to do. The ancient Indian Mantra Vidhya branch; Shaabri Vidhya has given a lot of unique mantras to remove pain from the body. Budh or Mercury is the planet which in Indian astrology is said to have a profound effect on the intellect of a person. Normally a planet which is beneficial; much depends upon its position in the horoscope and the associations with other planets. A good night’s sleep is important for individuals of all ages. As parents of young children will readily attest to, a toddler who has not slept well (and, truth be told, a teenager who has not slept well) can be a nightmare to contend with. This is why many parents try to ensure that their little ones find a sleep routine that works for the family and, best of all, provides restful sleep and a greater likelihood of good behavior. No child wants to go to sleep early and, often, parents resort to bribes—from one more story to the promise of a piece of candy the next day. Something many people may fail to consider, however, is the importance of a bed that the child likes and enjoys. Today I am giving a very powerful Shiva mantra for the protection of children. This is a rare Sadhna, so please do not misuse it. The Shiva Mantra which is given below has to be written on a Bhojpatra paper with blue ink and then this Bhojpatra paper has to be put in a locket, either of metal or a waterproof cloth. Then this locket has to be tied or woven into a black thread and put around the neck of the child. The Sun or Surya Dev in Hindi is central to our existence. It’s as simple as that and there is no argument; without the Sun we won’t exist. The Sun or as Surya as he is called in India, is not only a Star, but a living God. Death is an unchangeable truth of life. It is something ones sub-conscious mind tries to avoid thinking about. Hence the sub-conscious mind more often than not does not identify with death; like with most other certainties of life. Hence for the normal person death is something which happens to other people. This is a post on the secret of death. The planet Venus or as Shukra as it is known in Hindi has a lot of romance and romantic tags attached to it. It also symbolizes love, romance and the lover. Venus also has a lot of mystic attached to it. 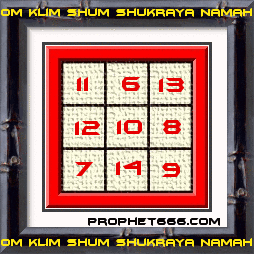 The planet Shukra also stands for purity in all walks of life. There are numerous other qualities like wealth, arts, beauty, attraction and magic amongst others which this planet symbolizes. The Sivananda Lahari a composition by Adi Shankaracharya, like all his compositions is alive and filled with mantras with the highest vibratory frequencies. The Sivaananda Lahri translated into English means the Waves of the happiness of Shiva. The recent exposures of the multi Billion Dollar corruption scams and the utter helplessness of the Indian Political system to do anything about it ,brings up the next logical question – Has the Indian Political System collapsed? Just as the world entered 2012, I had interpreted a Quatrain of Nostradamus being the one which referred to World War 3 being triggered off due to a couple of major assassinations. The post can be read HERE. At this moment of time the Iran crises looks to be the most likely trigger. Someone obviously is looking just for that trigger or is trying to create it in quick time. Mostafa Ahmadi Roshan, Director of Natanz - Iran's main uranium enrichment facility, was assassinated in a most professional manner. A spherical Fullball world or slow spinning bigger disk world isn't the biggest possible achievable single world for future many magnitudes vastly bigger expanding populations Hugely bigger freely floating settlement worlds could in fact be formed as ring worlds of full ring radius comparable to an inner planet's orbit radius, (while shaped like a simple ring around your finger). This would be best around a dim small star which will age very slowly and never expand like Sol to some eventual much bigger hot size. 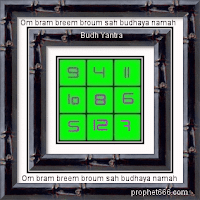 This is a Yantra for Jupiter or Guru the largest of the nine planets in our solar system. Guru is said to be that planet in astrology who is the giver of fortune, luck, fame and wealth; amongst the numerous qualities which have been attributed to him. Guru is also symbolized as the imparter of knowledge; the teacher. 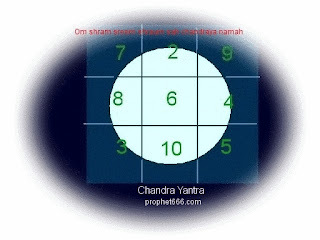 This is the Yantra for Shani or Saturn; the most feared of the heavenly bodies in the cosmos. Shani is the dispenser of justice or Karma, what you sow, comes back to you in the same measure. Shani also ensures that you get back what you have lost, none can escape this divine justice. This is a Paranormal Indian remedy which is used to avert abortion. Many unfortunate women suffer from the problem of repeated abortions. In such cases the paranormal Tantrik offers some kind of solution or the other. This is one such simple remedy which I found to be not only interesting but does not require much effort or expense. Shri Ganesh the popular and loved God in India is worshipped in a total of 32 forms or manifestations. Each of these forms has profound spiritual significance attached to it. The Ucchista Ganesha form of Ganesha is one of these 32 forms; it is I have noted not a commonly worshipped form of Ganesha. 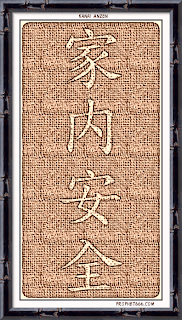 Kanai Anzen is a famous and popular Japanese amulet of Shintoism. Shintoism is like Hinduism and Buddhism a profoundly spiritual religion. Kanai Anzen is an invocation to God to always keep ones family free from harm. This amulet is said to generate positive and protective vibration; and is said to be beneficial to health and safety of the household, it is also said to bring good luck if kept in the house. It can be taken as an equivalent of the traditional Indian Yantra for the same purpose. 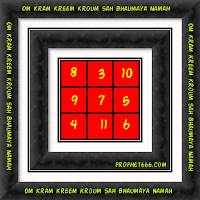 This is a most powerful Yantra which is prepared on a Bhojpatra paper and written with Ashtagandha ink and kept in a prominent place in your home. 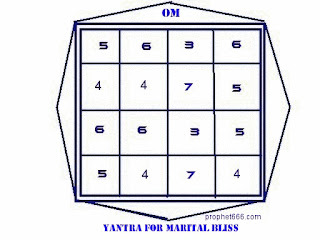 This is a Yantra for marital bliss, peace and love between husband and wife. This particular Yantra has been especially prepared by me for those readers who write to me seeking a solution for their martial problems. 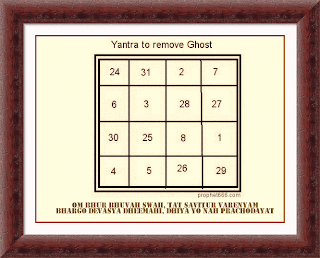 This is said to be a powerful Yantra to remove a Ghost from the body of a possessed person. 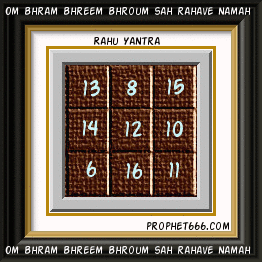 This Yantra has to be prepared on any Tuesday. 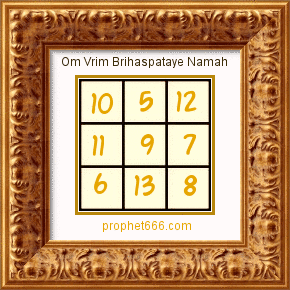 The Yantra has to be written on a Bhojpatra leaf, with Ashtagandha, using a pointed stick of the Pomegranate tree, and then this Yantra has to be tied on the hand of the possessed person. 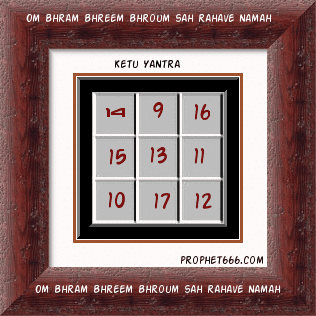 This is another Yantra which is used by Tantriks in India to control enemies. This particular Yantra is to be written on a piece of paper. 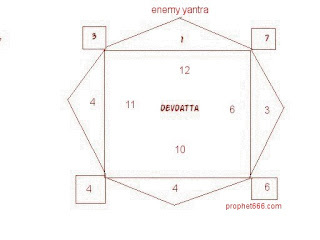 The name Devdatta has to be replaced by the name of your enemy. The language can also be written in your native tongue. 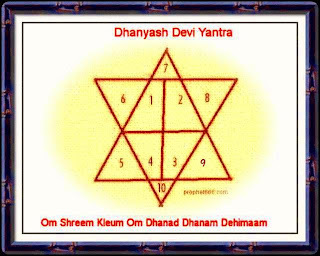 The Dhan Yash Devi Yantra is a geometrical configuration which is drawn in your house, shop or office to attract wealth . The words Dhan Yash translated into English mean success in wealth. This Yantra the Goddess of which is Mahalaxmi can be drawn on paper with red vermillion. 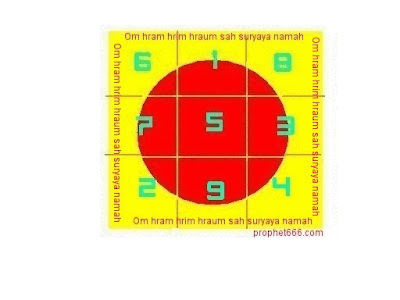 When the Yantra starts getting soiled, immerse it in a water body like a lake, river or well, and draw a new Yantra.The English words can be replaced, if you wish with your mother tongue. 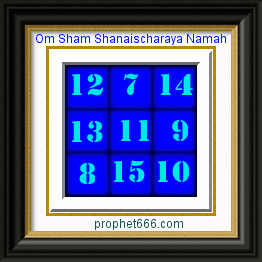 This is a Yantra to increase intelligence. 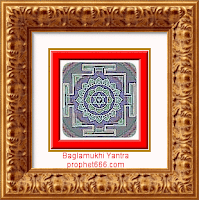 The Yantra given below has to be written with a sharpened stem of a rose on a Bhojpatra paper. The paper made from the bark of the Bhojpatra tree [Himalayan Birch], has been used since ancient times for writing purposes in India, and is considered to be most auspicious. Shiva is one aspect of the Hindu Divine Trinity of the Creater, the Protector and the Destroyer. Shiva is the Destroyer or the re generator. Shiva is worshipped in numerous forms and manifestations all over India. 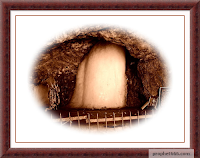 He is also worshipped as the Shivling; the divine light of Shiva. Shaivites; those who primarily worship Shiva as the Ever-Existent or the Eternal one, forms one of the major chunks of the Indian population. The Shivling is one of the most important of the Hindu religious symbols. This symbol of Shiva representing his creative energy, at its peak, is often described as the divine light of Shiva. Shivlings are present in every nook and corner of India. One question asked more often than not is how to worship the Shivling; what is the specific mantra to be recited while worshipping the Shivling. Panchagni Yajna described in the ancient Indian scripture the Chandogya Upanishad, is practiced to reach Brahma Lok or Salvation. This is a much sought after ritual in India. The literal meaning of Panchagni is “five fires” and Yagna is “Sacrifice”. So Panchagni Yagna literally translated means “Sacrifice to the five fires”. This is a rare traditional Indian remedy which is prescribed for those women who wish to get pregnant. This remedy is given here for information and educational purposes, and not to advocate the use of the same. To use the same please consult your doctor first. This Prophecy of Nostradamus has been popularly interpreted to be the one descriptive of the Kennedy assassinations. While interpreting the Kennedy assassinations, I had indicated the vagueness of the interpretation. The Baglamukhi Yantra is considered to be one of the most powerful of the Hindu Yantras or geometrical configurations for the protection against evil and evil energies of all kinds. The Goddess Baglamukhi is in the Hindu religion that infinite energy which has the infinite power to turn anything into its exact opposite. This is probably the main reason why Baglamukhi worship has gained so much prominence in Tantrik worship. 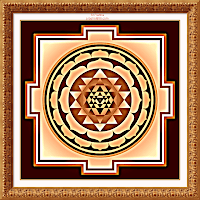 Let’s begin the year 2012 on an auspicious note by looking at the Sri Yantra.The Sri or Shri Yantra is arguably considered to be one of the most powerful of the Hindu religious symbols. The Sri Yantra is a geometrical configuration of triangles which are said to symbolize the union of Shiva and Shakti, this pure union of the male and the female energies is said to be Hinduism's highest Union.